In August 1613, two representatives from the City of London, George Smithes, Alderman, and Mathias Springham, Merchant Taylor, along with ten experienced local officers, “viewed and trode out the ground at the Derry for the fortification there”. That simple act, four centuries ago, has left us a tremendous physical legacy in the form of the largest ancient monument in Northern Ireland; it also left an enduring imprint on the cultural identities of the people of Ireland and Britain. During National Heritage Week in 2013, Walled Towns across Ireland explored the heritage of their ramparts, gates and towers. Sunday 25th August was “ Derry’s Walls Day 2013”. An interdenominational service in St Columb’s Cathedral was an appropriate start to the day. This was followed by Wave on the Walls! and a 1613 Charter Market at the Ship Key. To recreate the marking out of the walls by the two Londoners and the 10 ten local officers four centuries ago, 1,950 joined with us in creating a continuous red line of volunteers wearing specially designed t-shirts along the top of the ramparts. While the event was free, everyone was encouraged to make a voluntary donation to Foyle Hospice, a local charity. 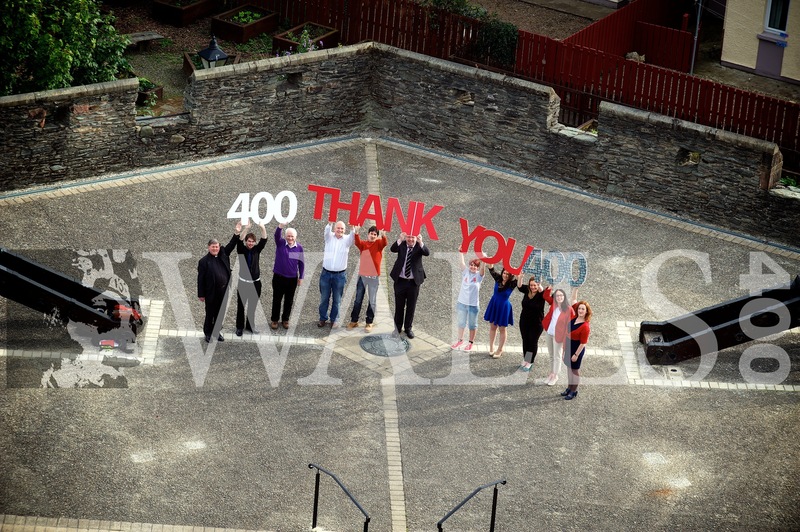 400 years on, we wanted the most diverse group of people make a BIG statement that Derry’s Walls belong to EVERYONE. Foyle Camera Club were involved in a project to document the day and their photographs can be viewed below. The Nerve Centre and Rory McSwiggan provided the camerawork from the helicopter and their creativity can also be viewed below. A big thank you to everyone who turned up for this history-making event, which you will see from the pictures and video was part-art, part-performance, part peace-building and mostly madness. Thanks to University of Ulster interns Sarah and Janeen and Business in the Community GAP placement David and Stephen Kelly of Velocity and Tom Casey of Trufflepig for core support in making this event happen. Thanks also to Volunteering North West who provided essential helpers in the run-up to Derry Walls Day 2013 and at the event itself. Thanks to the Playhouse, Past Pleasures, Claiomh, Period Arms, Forthill Farm and Derry Print Workshop for creating the 1613 Charter Market. Thanks to St Columb’s Cathedral for hosting the inter-denominational service which kicked Derry Walls Day off. Thanks to Foyle Camera Club and other volunteer photographers who helped document the day and to Derry City Council, the Apprentice Boys of Derry and St Columb’s Cathedral for allowing access to their buildings during the day. 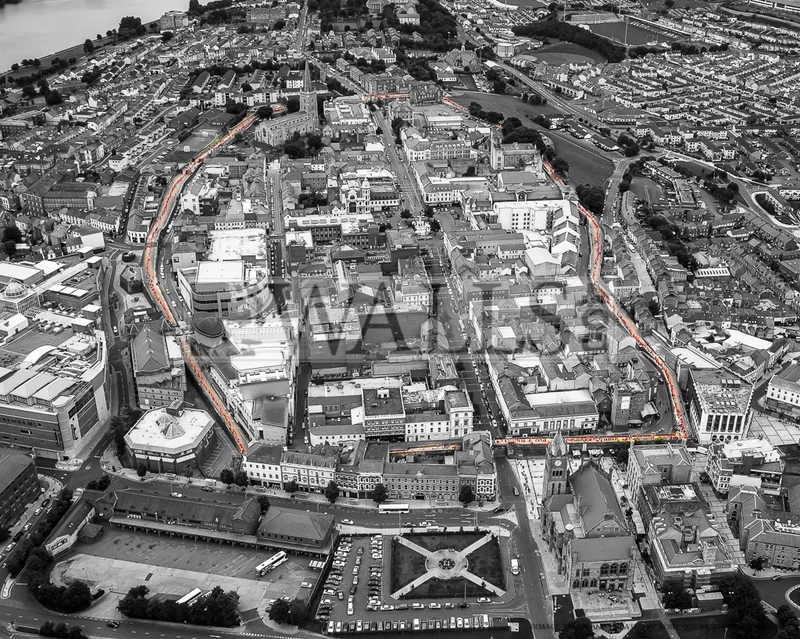 Thanks to DRD Roads Service and DOE NIEA for permissions to use Guildhall Sq and Derry’s Walls for Derry Walls Day. Thanks to Reina Chano M.S. Candidate, Historic Preservation, at the University of Pennsylvania, School of Design who helped with the design of this website and the social media feeds for the event. Gallery by Rory O’Doherty Photography. Some sample photos taken by Rory O’Doherty from the helicopter are shown below. These are available for purchase online, with a portion of proceeds going towards charity. Click on the pictures to enlarge.